It's easy to learn how to make an origami eagle when you have good step-by-step instructions and diagrams. The Internet is full of resources for making folded paper animals. Take your project a step at a time, and soon, you'll have a beautiful three-dimensional representation of a bird of prey. Origami is an old and well-respected Japanese art form that involves using a single sheet of paper and lots of precision to create a beautiful three-dimensional object. Ideally, you don't cut or glue the paper at all. Animals are popular projects. In order to create any animal, you'll need to start with a square sheet of paper. 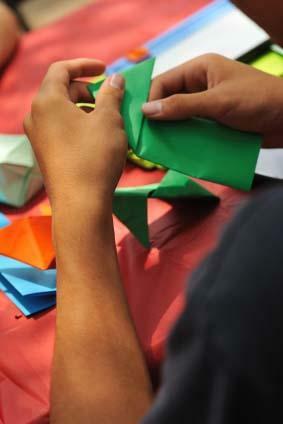 You can use almost any type of paper to make a folded animal, but origami paper is the easiest material for beginners. The papers should be thin and strong. You can use a patterned or metallic paper for an exciting look. The only other important tool is a good folding surface. A table or counter works great. It's important to have a hard surface because many of the folds require you to crease the paper. Mountain fold: This term simply refers to folding the piece of paper in half with the fold forming a peak. Valley fold: Here, you fold the paper in half with the fold forming a valley. Push in: This more complicated term refers to opening the structure out in order to change the shape. If you're in doubt about the meaning of a term, look it up before continuing. All of the folds require you to be very precise, so it's important to be familiar with the project before you even begin working with the paper. The photographs on Origami-Instructions.com make it easy to understand each step used to create the frog base. Folds.net offers easy-to-follow instructions with excellent diagrams. WonderHowTo also has a great video with instructions for making your bird of prey. The instructor is very clear, and there are instructions to help you build the frog base. You can also create a three-dimensional eagle out of a dollar bill. Dollar-bill origami differs from the traditional art in that it uses money, rather than a square piece of paper. While it's not traditional origami, it can still be fun. Beginners sometimes find it's helpful to start out with a large sheet of paper. Try a piece that is eight inches square. Watch the video or read the instructions a couple of times before beginning your project. You'll find that if you familiarize yourself with the steps before starting, you'll avoid some of the frustration of learning a new design. Be precise. Origami depends on making sharp creases and exact folds. Take your time and make it perfect. Don't forget to have a good time! You're creating something beautiful out of a two-dimensional sheet of paper. Enjoy yourself while you practice this ancient art.